Palmyra Atoll is one of the Line Islands in Micronesia, 960 nm (1,778 km) south of Honolulu, about half way between Hawaii and American Samoa. Its nearest neighbor is uninhabited Kingman Reef to the northwest; the nearest inhabited islands are those of Kiribati. Travellers are permitted to visit the refuge by private boat in certain circumstances. Visits must have prior approval. Palmyra is equatorial and hot. It's located within the low pressure area of the Intertropical Convergence Zone (ITCZ) where the northeast and southeast trade winds meet, which has also contributed to its shores being littered with debris carried by Pacific currents. It is extremely wet with between 4,000-5,000 mm (160-200 in) of rainfall each year. 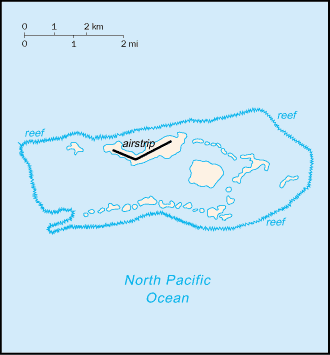 Entry into the Palmyra Atoll is Heavily restricted, and requires special permits to visit, often from the U.S. Military. This even applies to U.S. and American Samoan citizens. There is a 2000-meter unpaved airstrip on Cooper Island (the largest island, in the north), owned by the Nature Conservancy. There are two moorings in the lagoon just off Cooper Island. 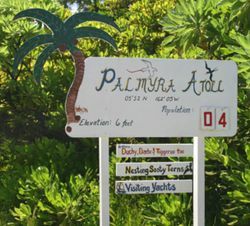 There is currently no economic activity on Palmyra Atoll. This page was last edited on 11 May 2018, at 17:57.